Ever since I hit “publish” on my post about learning to sew, I’ve been getting requests for a similar post about knitting. It’s been in the works for a while but I figured now with the weather cooling off, it’s the perfect time to introduce you to this cozy calming hobby! Knitting was not previously on my radar as a skill that was remotely attainable to me. However, an acquaintance put out a broad call on social media to see if anyone might be interested in taking an introductory knitting class at a local knit shop and I thought, what the heck, I’ll give it a try! I strongly recommend taking an intro level class to get the basics down pat. Once you have those, you will be well equipped to knit up all sorts of advanced patterns with the assistance of the internet brain trust. In the first class I was informed by the teacher that we would be knitting a sweater as our project and I couldn’t believe it. What sort of crazy pills made her think that I, someone with almost know knitting knowledge, could make a sweater? While this seemed bananas to me at the time, I now realize this is an absolutely brilliant approach! By knitting a simple sweater with basic construction, I learned how to knit and purl but also how to read a pattern, how to knit with circular needles and double pointed needles, how to hold stitches for later, how to shape a garment, understanding gauge, and more. There were so many important lessons in this one project that you would never master if you knit only scarves or hats. If you can find an intro class with an ambitious (to you) project, go for it! You’ll be glad you did. Knitting is an ideal hobby for me. Its repetitive motions provide a calming effect and I turn to it often when I need to relieve stress. I love being able to create beautiful handmade garments, accessories, blankets, and stuffed animals for myself, my family, and friends. Given my ongoing efforts to pursue a slow fashion approach to my wardrobe, I no longer buy sweaters since I can make them myself and have complete control over sizing, yarn selection, colorway and more. While knitting provides less instant gratification than sewing in most instances, there is something really satisfying and intentional in making a garment stitch by stitch – literally creating the fabric that composes it. I also love discovering pattern designers with aesthetics very much in line with my personal style. There are so many great indie pattern designers out there and the notion of knitting being an activity for older women creating frumpy pieces is flipped on its head. Practice makes perfect: I said it with sewing and I’ll say it again here – just practice! Practice is especially important in knitting as there is a great deal of muscle memory involved. The more you knit and purl, the more second nature it will be, and before you know it, you’ll be whipping up cables and fancy lace panels like it’s NBD. Learning to fix your mistakes: This is vital, so be sure that you address this with a teacher or more experienced knitter. I have tried to help a few friends learn to knit and everything is going fine until suddenly it isn’t and they give up entirely. Since you are actually creating fabric, it can seem hopeless if you discover a mistake in your work, but there are strategies to remedy these errors and often you don’t even have to unknit or unravel your work to correct them. Research and plan: Looking through social media hashtags and finished projects on Ravelry to see how other people’s projects have turned out is crucial. There are some patterns that catch my eye initially but when I see other people’s finished works I know it’s not likely to be an outcome I am happy with. Due to the time investment in knitting, I want to be certain a project is going to work out as desired, so this initial investigation is helpful. Just as fabric choice is important with sewing, yarn choice is vital to the final outcome of your project. I discuss Ravelry in more detail below but looking at the “yarn suggestions” tab for a particular pattern is really helpful so you can see the way the fabric looks based on the yarn you may select. Make detailed notes: If you make any modifications to a pattern, make note of them so you know exactly what you did, especially if you’re making a change to something on one side of a garment that needs to be mirrored on the other. I also find it really helpful to make notes about when to make increases and/or decreases before I start a section of a pattern so I don’t have to keep mentally counting or adding rows. For example, if a pattern states to increase every eight rows six times total starting at row 25, I’ll write out “increase on rows 25, 33, 41, 49, 57, 65” so that I’m less likely to miss these cues. Fit as you go whenever possible: Some projects don’t exactly allow for this due to their method of construction, bottom-up sweaters or pieced sweaters in particular, but top down sweaters let you easily check for fit to ensure you are happy with the length of the sleeves and body. While it is trickier to fit bottom-up garments, it can be done. I may write about my approach to this in the future, but that is beyond the scope of this post. Ravelry: Honestly, I should probably just say 1. Ravelry, 2. Ravelry, 3. Ravelry. It is difficult to articulate what a brilliantly constructed site that is, so I urge you to go have a look around yourself! You can do SO much there: find patterns and save them to your favorites, organize your future projects in your queue, view finished objects and read notes from other Ravelers who have already made a project you might be interested in, get automatically generated pattern suggestions from the site based on your already favorited items and designers, and the list goes ooonnnnnn. All that pre-project research can happen here and Ravelry’s smart design makes it easy as can be. Very Pink Knits on YouTube: Stacy’s knitting tutorial videos are always my go to whenever I encounter a new to me stitch or skill in a pattern I am making. Her explanations are very clear and she repeats them multiple times, but there isn’t an unnecessarily long introduction – they are thorough but concise. KnitCounter app: This app has been incredibly helpful in keeping track of my rows in various projects. You can create different counters for each part of a garment – for example, body, sleeve 1, sleeve 2, cuff 1, cuff 2, etc. This is in keeping with my suggestion above of taking good notes during your projects, and thankfully this app does have a space for making notes. I keep careful track of my rows to ensure that sides of garments are perfectly even and all shaping happens when it is supposed to. These are a handful of projects I started out with earlier on in my knitting. However, be careful to avoid limiting yourself unnecessarily just because a project isn’t expressly “beginner” level. The only way to learn skills and techniques is by doing! 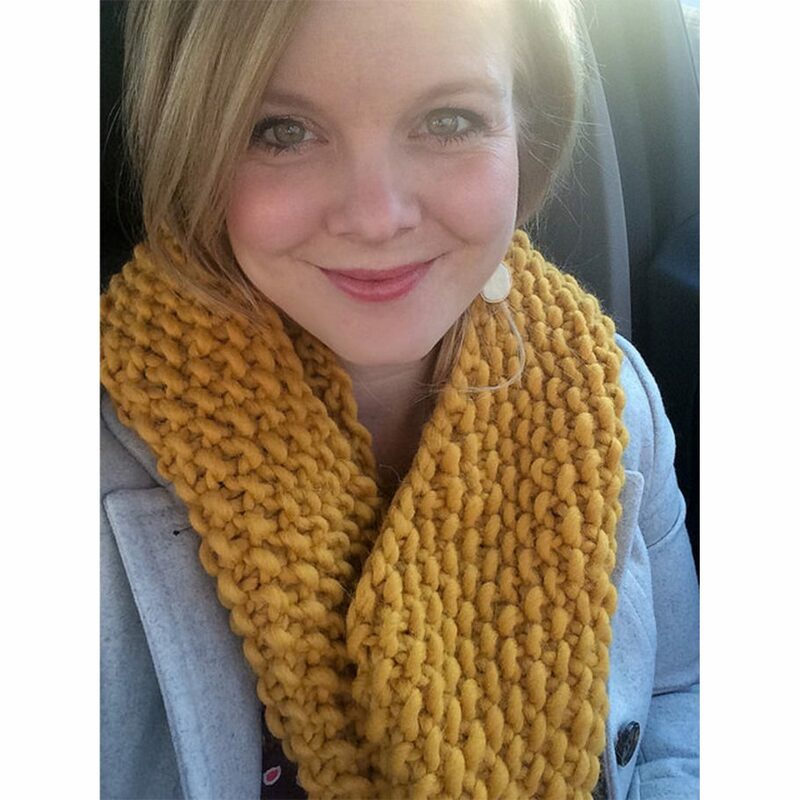 A chunky cowl is one of the very easiest things to make, and it is one of the closest things to instant gratification that knitting has to offer. I made some of these to gift to friends a few years back and I love them! Leg warmers on sweet little baby and toddler legs – I mean, what could be cuter? A self striping yarn makes these easy peasy. You could certainly make the stripes using multiple different yarns but then you’ll have more ends to weave in which isn’t difficult, but if you can avoid it, why not? I love gifting these to new and soon-to-be parents. Appreciate the beauty that comes from holding two different yarns together as you knit for a gorgeous marled look. 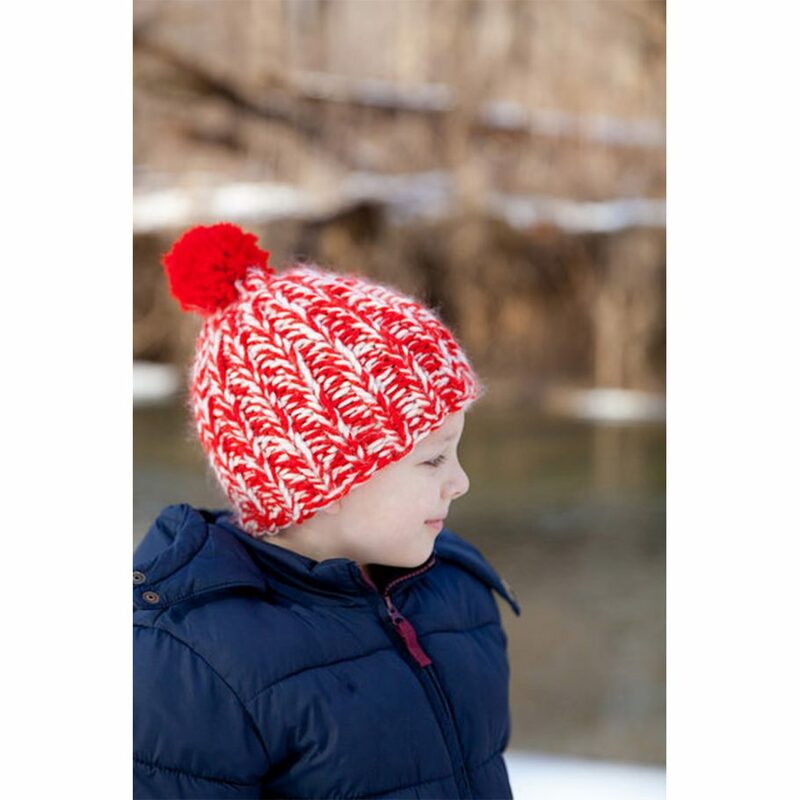 This hat uses soft, chunky yarn for a super quick and fun winter accessory! These fabulous fingerless mitts include a seed stitch glove, a ribbed cuff, and have a convertible flap so that you can fold it down over your fingers in super cold weather. It might sound complex but it’s actually quite simple. I love these and wear them often! Yet another pair of fingerless mitts because in my opinion, you just can’t have too many! This pair includes a ribbed sleeve and separate garter stitch cuff that are sewn together. You can make the two pieces in coordinating colors or different colors for a dose of contrast. Eek, a sweater! But I promise, you can do it. As sweaters go, this one is pretty simple. This one will help you practice lots of useful techniques such as top down construction, color blocking with marling, bobble creation, and ribbed edging. I wrote more about my bobble yoke sweaters here. This tee might look complex but the construction is actually very basic. I added some waist shaping to mine (details here) but that isn’t necessary. Purl Soho kills it with their wonderful free patterns! 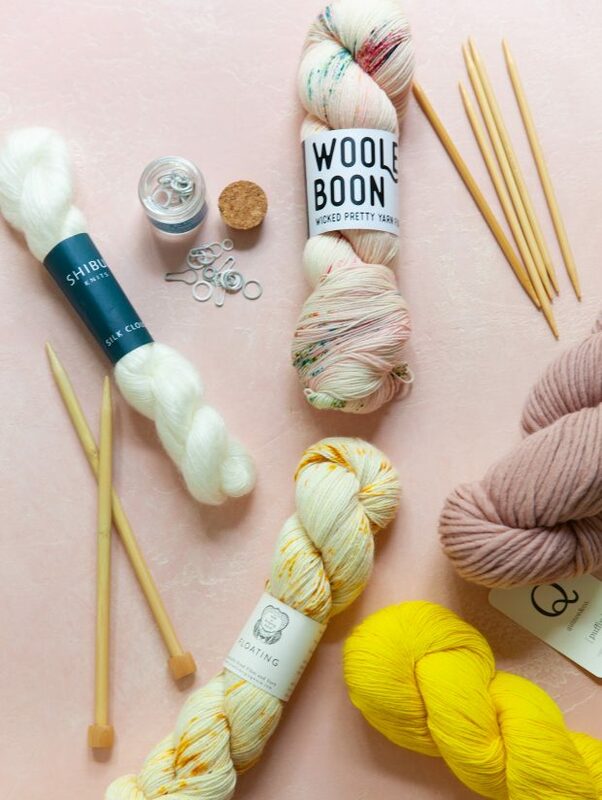 To spark inspiration and hopefully help you see that you can knit stylish beautiful pieces, here are some of the pattern designers and collectives I love most! I’d love to hear what else you want me to cover in the realm of knitting. I’ll keep sharing my projects whenever possible but please let me know if you have questions or a specific request.